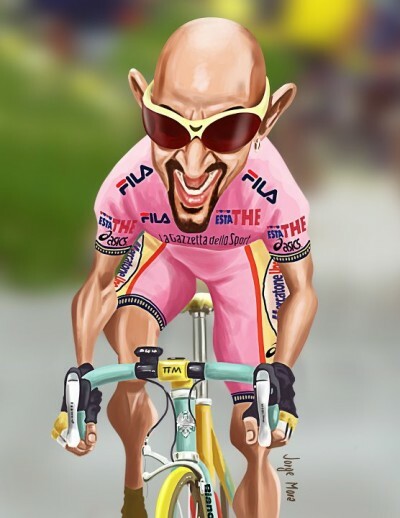 Posted this caricature of Pantani by Jorge Mora last night. Sal Ruibal replied with a blog post about Il pirata’s suicide note. Sal posted it under his Nick Verstain alias and it was published in Dirt Rag in 07. I got teary reading it. You will read this after, so I want you to know I was happiest on the bike. For all of my memory I felt the most at home With my feet on the pedals and the world moving around me. The perfume of grease, mentholated embrocation and the heat in my legs. Matt Rendell wrote about the life and death of Elephantino for the Guardian in 04. The sport hasn’t seen a character like Pantani since. It needs one.